This paper demonstrates 3-Dimensional (3-D) practice environments developed to teach mechanical skills. The instructional strategy integrates multimedia Computer-Based-Training (CBT) with a structured 3-D practice environment and a virtual 3-D practice environment. The entire multi-layered application can be delivered via Web browsers on a corporate local area network (LAN) or on the Internet. The multimedia CBT and structured 3-D practice environment were implemented for traditional CBT delivery and were converted to Web delivery. The virtual practice environment is a desktop Virtual Reality 3-D space that was implemented with the Virtual Reality Modeling Language (VRML) and Java for Web delivery. Realism is added to the multimedia CBT and practice environments by using 3-D Computer Aided Design (CAD) models as the source for images, animations, and user-controlled objects. Training mechanical skills requires developing the cognitive, perceptual, and motor skills of the student. The student must be taught to visualize the complex relationships between mechanical components, diagnose problems, and perform corrective actions. Demonstrations, simulations, performance-based laboratory exercises, and on-the-job-training (OJT) in an apprenticeship program are typically used to teach mechanical skills. These techniques emphasize the development of motor skills but do not adequately address the perceptual skill development needed to become an expert. Multimedia CBT techniques with realistic 3-D practice environments appear to offer a natural solution for improving the perceptual skills of students. Practice is extremely important in the development of perceptual and mechanical skills. Perceptual skills are improved by giving the student a practice environment to explore and experiment with the mechanical system. The instructional strategy is shown in Figure 1. Figure 1. Instructional Strategy with 3-D Practice Environments. The instructional strategy illustrated in Figure 1 uses multimedia CBT techniques to teach basic concepts, show problem solving approaches, and demonstrate performing corrective actions. The multimedia CBT can be distributed using traditional CBT delivery techniques or can be delivered via the Web with a Shockwave server and a Web browser with the appropriate plug-in. The instructional designer defines the animations and illustrations needed to train basic concepts. Renderings and animations using 3-D CAD models are heavily used to portray realistic situations to the student. 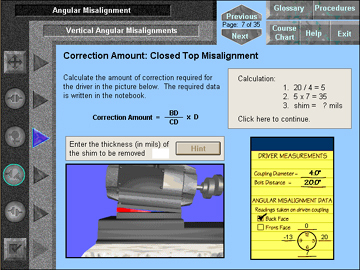 Figure 2 is a multimedia CBT example showing the use of 3-dimensional animations to illustrate the complex relationships between the mechanical components and tools for a typical shaft alignment situation. The animations in Figure 2 provide the level of detail needed to show the shafts, couplings, tool mounting brackets, and the dial indicator. Once the student has learned a concept with multimedia CBT, problem solving practice is provided within the structured 3-D practice environment. After mastering problem solving in the structured practice environment, the student enters the virtual 3-D practice environment to practice more realistic and advanced mechanical skills. The primary difference between these two practice environments is the amount of freedom the student has to interact with and explore the objects in the environment. The structured practice environment guides the student during problem solving activities, whereas the virtual environment is a free, exploratory environment with limited guidance. The objects in the virtual practice environment have more realistic and dynamic behaviors. In the structured practice environment, the student's interactions with the tools and equipment have been designed by the instructional designer to teach a specific concept and allow the student to practice performing a specific task. The viewpoint of the 3-D structured practice environment has been specifically designed to support the concept being learned. The actions performed by the student are limited to support the concept being learned and the actions being practiced. The student cannot explore the situation freely -- this is the power added by the virtual practice environment once the student has mastered the skills taught in the structured practice environment. Figures 3 and 4 illustrate practice sessions in the 3-D structured practice environment. When taking measurements with the dial indicator, the student is taught to relate the round coupling face to a clock face. The student uses 12 o'clock as a reference point by zeroing the dial indicator and taking measurements at the 3, 6, and 9 o'clock positions. Figure 3. Structured 3-D Practice Environment. determine the rotation direction. The arithmetic sign of the reading is positive for clockwise rotation and is negative for counterclockwise rotation. count multiple rotations of the dial indicator needle which have to be factored into the reading. look for the dial indicator needle rotation to change directions. An arithmetic sign change occurs for the reading if the needle crosses the reference point while rotating in the opposite direction of the last reading. If the previous reading had multiple rotations of the needle, the reference point is only crossed after rotating in the opposite direction for the same number of rotations. When the student has rotated the dial indicator to the correct position, a message is displayed asking the student for the reading. The student's readings are accumulated in a measurement worksheet so that he or she can analyze the measurements to determine the type of misalignment and compute the amount of correction needed. Feedback is provided for correct and incorrect measurements as part of the structured training process. This technique is also used for the student to practice taking the 6 and 9 o'clock readings and completing the interactive worksheet. A problem solving session is shown in Figure 4. The student uses the measurements recorded in the worksheet to analyze the type of misalignment and determine the amount of correction that needs to be applied to the motor. Random problems can be generated in the structured practice environment, providing a variety of learning situations. Values for the bolt distance, coupling diameter, and worksheet measurments that correspond to the type of misalignment problem are randomly selected and placed in the worksheet. An animation corresponding to the misalignment correction is played when the user correctly solves the problem. Figure 4. Structured 3-D Practice Environment Problem. Practice environments provide a way to learn by discovery and gain experience by performing tasks. A student needs to bridge the gap between learning a concept and applying the concept on the job. The practice environment in Figure 3 is ideal for practicing a complex skill where the student must visualize equipment relationships and responses to the student's actions during a complex sequential process. The student is guided and coached to perform a specific sequence of tasks, one step at a time, while observing equipment relationships and responses. With the structured environment, the student can focus on the specific situation and perform the required tasks without the distractions of unrelated system responses and user actions. The practice environment in Figure 4 provides practice in analyzing a wide range of complex problems. After mastering the tasks necessary to take the measurements from a representative mechanical system, the student needs to practice analyzing the different situations represented by his measurements. With the practice environment in Figure 4, the student practices associating measurements and instrument readings with specific problem situations and selecting the appropriate corrective actions. Figures 5 and 6 illustrate two approaches to problem-solving in the virtual 3-D practice environment. 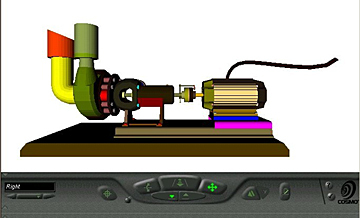 In Figure 5, the virtual 3-D practice environment is a complex VRML scene composed of a pump, a motor, shafts with coupling housing between the pump and motor, the coupling gaskets, and a properly mounted measuring instrument (dial indicator) with mounting brackets. This figure shows the Right Viewpoint. Other available Viewpoints are the Left, Top, Bottom, Front, and Back. The student can also zoom closer to areas of interest. Figure 5. Complex VRML Scene in Virtual 3-D Practice Environment. Figure 6. Simple VRML Scene in Virtual 3-D Practice Environment. Virtual practice environments provide the freedom for the student to learn by discovery and gain experience by performing tasks using realistic tools on a realistic system under the stresses of a realistic job situation. After mastering the basic skills needed to solve complex problems with the structured practice environments, the student is ready for the challenges of a virtual practice environment. The student is free to explore and practice performing tasks with all of the distractions of a realistic situation. VRML offers the ability to display and interact with 3-D objects using a VRML capable Web Browser. A VRML object is a geometric representation of a real-world object. Most of the standard 3-D CAD model formats can be translated into VRML objects and displayed by a VRML capable Browser. A VRML scene is the placement of the VRML objects in the virtual environment. A VRML capable Web Browser provides a user interface for viewing and walking around a scene composed of VRML objects. Users can interact with objects that have dynamic behaviors. Existing 3-D CAD models can be converted into VRML objects and placed in VRML scenes. This re-use of CAD models reduces the cost of creating VRML scenes and provides a smoother transition between the practice environments and the real world. Animations and behaviors can be added to the VRML objects in a scene to provide simple user interactions and improve scene visualizations. Java can be used to add complex behaviors that mimic realistic user actions and equipment behavior. Navigation by walking around the mechanical components can provide a tremendous improvement in the user's understanding of the relationships between the components. Viewpoints can provide a tremendous improvement over our 3-D structured practice environment. We implemented 6 standard viewpoints: Front, Back, Left, Right, Top, and Bottom. These viewpoints provide a rapid navigation mechanism from one view to another and alleviate some of the student's frustrations with sluggish navigation for complex scenes. 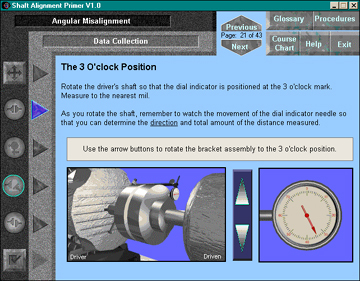 Interactive users can quickly improve their understanding of the mechanical components by exploring with the viewpoints. Zoom and pan functions provide an improvement over our 3-D structured practice environment. The interactive user can quickly zoom to investigate areas of interest. The VRML scenes that use 3-D CAD objects are very large. The VRML browsers take a long time to load the scenes and browser navigation can be sluggish. Spatial orientation is difficult with the browser user interface. It is very difficult for an interactive user to select and accurately place objects in 3-D scenes using VRML sensors and interpolators. Java must be used to implement the behaviors required for realistic spatial orientation activities. VRML seems to provide a natural path for implementing an affordable, realistic virtual 3-D practice environment. Although we have encountered disadvantages with the current technology, we believe that VRML technology will improve dramatically in the next few years. We are going to integrate our isolated VRML objects and scenes into a practice environment with problems and feedback. We are going to continue to investigate the user interactions and behaviors required for a realistic virtual 3-D practice environment. The approach we are pursuing is integrating VRML objects with Java to implement more realistic capabilities for the practice environment. (~150KB) VRML example: Dial Indicator with Mounting Brackets. This paper describes an integrated instructional strategy using multimedia CBT, a structured 3-D practice environment, and a virtual 3-D practice environment. The multimedia CBT and structured practice environment can be delivered via the Web or using traditional CBT delivery techniques. The virtual practice environment can only be delivered via the Web using a Web server and Web browsers. 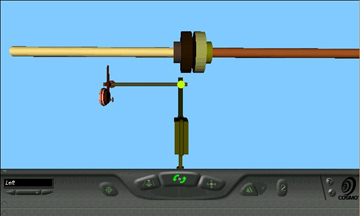 These practice environments were developed to teach mechanical skills for precision shaft alignment using the "Rim-Face" dial indicator method. The objective of our current research is to develop an affordable virtual 3-D practice environment to augment the training and practice provided by multimedia CBT and the 3-D structured practice environment. We are continuing to investigate VRML and Java approaches to implementing a virtual 3-D practice environment. We hope that the techniques described in this paper will encourage other training developers to consider the benefits of 3-D practice environments for mechanical skills training. [Johns 1998b] Johns, J. (1998). Improving Perceptual Skills with Interactive 3-Dimensional VRML Scenes, Journal of Interactive Instruction Development, pages 3 - 11, Volume 10, Number 4, Spring 1998. [Johns and Brander, 1997d] Johns, J., Brander, J. (1997) Improving Perceptual Skills with 3-Dimensional Animations, Journal of Instruction Delivery Systems, Volume 12, Number 1, pages 8 - 19, Winter 1998. [Johns and Brander, 1997b] Johns, J., Brander, J. (1997) Multimedia Techniques to Teach Mechanical Skills, Journal of Interactive Instruction Development, Volume 9, Number 4, pages 29 - 37, Spring 1997.